In the present dynamic world, the increased use of Automation and Robotics at various levels of manufacturing and industries, personal and consumer services, security and defence sectors, robotics and other related fields have grown manifolds in India and across the world. In our attempt to fill the gap between growing demand for robotics engineers in India and the lack of such skills amongst the faculty and mentors of our youth, become the part of this robotics revolution which is about to spark off in India! As per instructions given by management, the Robotics Team of Department of Information Technology, JIMS organized Robotics workshop for MCA students (Ist Year-both shift) students from 12th March to 15th March 2018. This workshop is designed for beginners and robotics enthusiasts of all disciplines. The participants were introduced to the basic fundamentals of robotics and the practical experience was given thru Hands-on sessions while working on the robotics kits, LED’s and IR sensors. The workshop helped them to enter into the world of robotics and to create an aptitude in the limitless field of robotics. They created various designs and got the feel of robotics and its powerful. 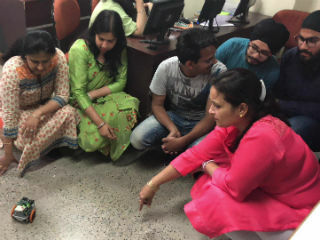 The resource persons were Ms. Suman Madan, Ms. Deepti Sharma and Ms. Disha Grover along with Mr. Narender(Engineer). 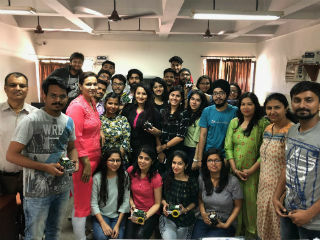 The workshop was attended by more than 100 students and they enjoyed working with self-made robots as per their logics. Students also made mini projects during workshop.